At the much-anticipated press-event that took place at OLPC HQ in Boston earlier today, the organization unveiled its plans for second generation of XO hardware. The XO-2, or XOXO as it's also called, comes with dual-touchscreens which has some tech journalists thinking of the Nintendo DS. As you can see on the photo to your right one of the touchscreens can be used as a keyboard to enable the standard typewriter style of computing. CGI rendering of the XOXO. "Younger children will be able to use simple keyboards to get going, and older children will be able to switch between keyboards customized for applications as well as for multiple languages." "While the first generation XO laptop already requires just one-tenth (2-4 watts versus 20-40 watts) of the electrical power necessary to run a standard laptop, the XO-2 will reduce power consumption even further to 1 watt." This is what I call collaboration. Based on this information it seems quite reasonable to assume that the XOXO won't be built on an x86 architecture. In terms of a release date for the XO-2 it was mentioned that OLPC expects it to become available in 2010, which sounds like a relatively realistic estimate. With regards to the price OLPC estimates the XO-2 to cost around $75. "One Laptop per Child and the XO laptop are crucial to the fulfillment of the proposed UN Ninth Millennium Goal: to ensure that every child between the ages of 6 and 12 has immediate access to a personal laptop computer by 2015." Oh, and in other news: G1G1 will make a comeback in late summer, probably August or September. XO 1.5 will be released in the spring of 2009 with the same design as the first generation but with fewer physical parts and at lower cost than XO 1.0. Sharing the goal for the next phase is great... BUT... it requires delivering and fulfilling the current goal. The XO is still incomplete. Incomplete in functionality. Incomplete in pricing target. If OLPC cannot deliver on this current vision why should anyone believe that they are capable of delivering on the next? The XO-2 looks fantastic... ON PAPER. But based on what I see in front of me with my XO-1, I cannot get too excited about it. And I won't get excited about it until the XO-1 vision is reality. But then again, I'm of the school that thinks, "Visions that cannot be realized are nothing more than whimsical daydreams and fantasies... and ANYONE can do THAT." Interesting concept... but did they say anything about tactile feedback from the touchscreens? Without some way for users to feel whether their fingers are centered on the "keys", typing could get awfully annoying. As to the "proposed ... millenium goal", you've gotta wonder who proposed it. Negroponte? They'd better get the parts availability thing sorted out before XO2. With the current XO you can open it up and mess about and fix things, but heaven help you if you've got a pooched monitor. XO2 with two monitors that are subjected to much more stress will be that much more vulnerable. I wonder, given how much bad press the last G1G1 generated, whether there will be many people signing up for G1G1-2. I know that if anybody asks me if they should, I'm going to have to qualify my recommendation based on what OLPC manages to do about the spare parts and repair service availability and the release of software update(s) over the next three months. Don't get me wrong -- I *want* to recommend G1G1-2. But I can't do so at the moment, based on my G1G1-1 experience. As for XO-1.5 or XOXO: I'll start believing in those machines (at *any* price) five minutes after my XO-1's "view source" button starts working. I wonder if the G1G1 pricing will be the same this August as it was last year. The price in many articles of $188 per laptop is the same number I recall hearing last year, and I would expect OLPC / Quanta to have reached some economies of scale by now. Since the laptop will remain the same, some of the key components should have dropped in price between Nov 2007 and Aug 2008. I couldn't justify spending $400 for a "$100 laptop" 6 months ago, but I could probably find $250-300 to participate in the G1G1 program this August. I would love to see the XO 1.5 by this August, rather than next spring. It would also be nice to see better planning for the laptop distribution for the next G1G1 program, as well as resolution to the hardware issues described above by David Wallace. Of course, being somewhat of a zealot, I would also need to be assured that both the "Get One" and the "Give One" laptops that I pay for will be preloaded with Sugar. While I can't help thinking that most touchscreens are currently only on toys and mobile devices, it will certainly make for some innovative games and graphics programs on the XO-2, as well as (hopefully) allowing for pen input and handwriting recognition. It's not like children under 12 are writing thousand-word essays anyways, so while a computer without a real keyboard would be useless to me, it might make sense based on the goals of the program. G1G1 on a laptop running XP? Forget that! In theory it could run on a moorestown x86 platform that should be in production before 2010. A 1w average could be possible given a no-radio, power saving screen situation. My question would be - what OS? From everything I read before getting my XO-1, I was sure that it was going to run on 1 Watt of power (at least at times). But then I learned that that wasn't going to happen until the dawning of Update-1, which was going to be in early January ... then February ... then April ... For months I was checking for it on websites every morning before doing anything else. Now that the OLPC team is going to be churning out two new laptops and making things work with Windows, Update-1 is never going to happen is it? (no 1W of power, no source key, no extended mouse pad, etc.) I don't really want to go through the drama of doing this all again. I wish they wouldn't temp me with that 1W dream. I refuse to give more money to microsoft. They destroy the goal and the spirit of OLPC. @ albert: Microsoft has nothing to do with XO-2 and the new G1G1 program. Why not wait until Microsoft actually does something with OLPC before making claims that they've "destroyed the goal" and "destroyed the spirit" of OLPC. I'd say it'd make most sense for the XO-1.5 and XO-2 to be using ARM based processor such as one from the already-OLPC partner Marvell. ARM is the best way for them to lower the cost, lower the amount of components, lower the power consumption and lower the weight. Then I expect somekind of super light embedded Linux based OS to be running on those next generation XO laptops. Hopefully cheap low power WiMax will be available in time for XO-2, while also still using mesh WiFi. A two screen $75 XO-2 might make sence, but so would a $55 one-screen XO with normal keyboard as well. albert, the simple reason why I think that the G1G1-2 laptops will come with Linux is that I don't see Microsoft making the $3 Windows XP Starter Edition licenses available to US donors. Charbax, it takes at least 2~3 years to design and develop a product such as the XO and switching over from x86 to ARM certainly is non-trivial (also in terms of the software). That would leave OLPC with the current XO design until 2010. So I believe that an interim XO-1.5 is actually quite a good decision. Will be interesting to see how different it is to the current design, how much cost can be saved and whether they'll upgrade any core components in the process (CPU, RAM, Flash). Do you think they'll be able to get me a replacement keyboard before G1G1-2?? "I don't see Microsoft making the $3 Windows XP Starter Edition licenses available to US donors." You're just being naive. It's called a loss leader, and it goes without saying that MS is *exactly* the type of company that would allow a $3 one-time release to a US market if it ensured they'd have a base for the $200 upgrade. It is sadly hilarious that people want to take a wait-and-see approach to MS when they have shown time and time again exactly how willing they are to screw their partners over. At this point the OLPC should just be called ComputesForSure. Not Required, I totally understand where you're coming from. However I do believe that you're wrong with your argument about MS having "a base for the $200 upgrade". The fact of the matter is that the XO offers no upgrade potential for future Windows operating systems as something such as the Windows Vista Starter Edition simply won't run on that hardware. Admittedly Microsoft might want to milk WinXP for what it's worth (maybe $10 a pop?) but I don't really see that happening. looks like a quite exciting concept. however with the XO-1 still not usable i'm very sceptical about this. a touch screen device needs a completely different OS and completely different applications. even the concept of the GUI will be absolutely new. so there will be no continuity from XO 1 to XO 2.
i wonder how that goes with a government having 10 mio XO-1 in it's schools? are they supposed to have two completely different systems in parallel? i guess that a similar device will be released by ASUS with a windows/linux system for $400 at the same time. Maybe this time i will go with the ASUS to get a usable machine. The event was originally billed as an education summit. Was there anything discussion about learning at the summit? "The fact of the matter is that the XO offers no upgrade potential for future Windows operating systems as something such as the Windows Vista Starter Edition simply won't run on that hardware." I think you are basing your statement based on the current hardware available on the XO and the current Vista software. XO's hardware is subject to change, just as the addition of the SD slot for M$, according to Negroponte. There is nothing to prevent Negroponte from increasing the hardware to accommodate M$ again. While Vista will not run on the current XO, I suspect that M$ is working on an upgraded XP (who knows what it will be called) for this new category of low power education laptops. good point Walter. I guess the participants are being "educated" about exciting new hardware and not sharing their thoughts and experiences on how to make this project work. To my knowledge, Windows XP doesn't run on the ARM processor, only Windows CE and Windows Mobile. Unless MSFT will make a lot work porting the XP kernel - which they weren't willing to do for the XO -1 -- I would be surprised to see XP or Windows Mobile on the XO-2. Can anyone comment on the durability of touchscreens in general? I am concerned about this. I am happy to see the swivel hinge go away. It is a great feature but it is also the one most likely to break. "Vista Starter Edition simply won't run"
I didn't say anything about Vista, I said upgrades. I don't have a crystal ball to say exactly what form those upgrades will take, but the bottom line is that Windows is a commercial product that MS has long been willing to make people choke on. Based on their past behavior, there is no reason to think they'll be doing anyone any favors regarding the OLPC. If they *do* create a Vista release for this new market of low-end portables, or possibly design the next iteration of Windows to be more scalable, you can bet that they'll use the same shady business practices to ensure that they can maintain their monopoly. Like I said, a $3 one-time release for a US G1G1 program is a no-brainer if they look at how much control it gives them in the long run. The new hardware puts more empahsis on Ebook-like apperance, and Nicholas repeated "Trojan Horse approach" meaning to say "it is an ebook" at first. and he also said "Not everybody (kids) has to commit full-brown constructionism from day one." He said good words on Sugar. People from Uruguay and Peru gave the summary of their experience. The situation in these two countries are (to me) surprisingly different. Uruguay is talking about "300 meter maximum walk to the Internet" for everybody, but Peru can be four days walk to the Internet in some area. Both described the deployment challenges. Glorianna Davenport showed her experience in Cambodia, Barry Vercoe showed a music editing app for children, and Mitch Resnick talked about Scratch as well as inexpensive version of Mindstorm idea. Of course the highlight of the event to me was the talk by Alan Kay. Human has 100,000 years of history but Science is only 400 years. Meaning that trying to have kids "discover" the ideas in science without guide is a bad idea. Also, using computer to mimicking old media is easy but not leverage full potential of dynamic aspect of computer. The right kind of mathematics can be naturally described in computer's way of describing it and make it accessible to kids. The 40 years of experience is there to teach culculus to kids but not widely used. Tomorrow, the day after tomorrow, and the day after that are supposed to be more like the past learning workshops and hopefully we have time to talk about education in focused manner. Walter called me on my concern regarding the XO-1's hinge. To date I have not experienced one single problem w/ the hinge on all the 155 XO-1s currently fielded in Nepal. Perhaps my concern is unfounded. Although I agree with many expressions of scepticism and frustration, I must say that several dimensions of this event are making me gain a lot of hope in the project. Thanks a lot to Yoshiki for describing the event in a way which makes sense to people who care about education. My sense is that one thing which changed (apart from the device's design) is an attitude. Sure, it might still be posturing. But what I'm hearing from the OLPC group is now much more palatable than the formerly prevailing attitude of shunning any kind of comment, competition, or request for information. Maybe it'll be short-lived but I sense something of a sea-change in OLPC's PR. Not marketing. Actual public relations. And, for a project with such lofty goals, appropriate PR is sorely needed. From Yoshiki's description, it sounds like at least three important issues were acknowledged: a) a simplistic version of constructionism shouldn't spoil the project; b) deployment is hard; c) different locations call for different solutions. Since we're into a hardware discussion, it would make sense to go towards a different processor than x86 because as someone suggested they are not a good low power device. If you list the desired features of an XO-2 you pretty much exclude windows XP as an operating system. For that reason Windows users would be more comfortable with Windows CE. You would also do away with the mechanical keyboard and hinge (although the hinge is purported to be reliable its still a mechanical part). You would in fact make the device almost devoid of external connections except for the ubiquitous USB ports. I'd go as far as to say that USB could be both a power input or battery charge port and use waterproof connections. Do away with the headphone/microphone sockets unless waterproof ones can be used. The whole package becomes a touch screen tablet device with wifi mesh, sealed internal battery, scratch proof reinforced dual mode screen. The advantages of this type of machine would give it an extremely long life in the field considering what I've seen of the current XO in use by G1G1 participants and more importantly their children. andiwm2003 said: "however with the XO-1 still not usable..."
Not that I'm saying the user-interface design for the XOXO is going to be trivial but that's a whole different topic. Tortuga said: "I think you are basing your statement based on the current hardware available on the XO and the current Vista software." Yes, I'm basing my comments on the XO-1 as we know it because that's the hardware which is going to be available for that G1G1-2 come August/September. And that's what we were talking about. Not Required said "I didn't say anything about Vista, I said upgrades." Then I'm not sure which upgrades you're talking about at that $200 cost... And I'm the last one to defend Microsoft but I'd prefer criticism of their behaviour based on facts not fiction. So far we've heard lots of fiction about Microsoft and OLPC, I reserve final judgement for when we get to see all the facts. Not Required said "Like I said, a $3 one-time release for a US G1G1 program is a no-brainer if they look at how much control it gives them in the long run." I haven't seen any sources that stated what hardware would be on the G1G1-2, if you have a source on that I would like to read it. I'm saying that Negroponte can make any change he wants to the hardware. And your definitive statement that "The fact of the matter is that the XO offers no upgrade potential for future Windows operating systems" not only does not take that possibility into consideration, but asserts that "the XO offers no upgrade potential". I'm saying their is upgrade potential in the XO, and Negroponte has the final say on it, and if he wants it to run some future upgrade or flavor of Windows OS it will be upgraded to do that. Tortuga, with G1G1-2 starting in August/September (according to all sources), the XO-1.5 not becoming available before spring 2009 (according to all sources), the XO-2 not becoming available before 2010 (according to all sources) and hardware changes, especially when it comes to a laptop and the upgrade potentially needed to make the XO "Vista capable", being non-trivial and taking some time (no matter what Negroponte might want) it's a pretty safe bet to assume that the G1G1-2 will be based on the current XO-1 hardware. "Can anyone comment on the durability of touchscreens in general? I am concerned about this." Seems that expressions of durability can be expressed in resistance to touches and material made of, like polycarbonate verses glass verses plastics, etc. Meets UL-1950 Steel Ball Drop Test. A 1-pound steel ball drops from height of 130 cm onto the center of the. glass without breaking. "Then I'm not sure which upgrades you're talking about at that $200 cost..."
I'm talking about the fact that Microsoft lists Vista Home Basic on their site at $119.99 to $199.99, and prices go even higher for Vista Ultimate. It's like you're pretending they never charged anyone $200 for Windows. Instead of expecting me to know their game plan inside and out, why don't *you* and/or OLPC get *them* to disclose in advance what their price structure is beyond just the $3 installation charge? "Let's see what happens and whether it's really such a no-brainer..."
We *have* seen what happens to companies that partner with Microsoft. That is why they should not be given the benefit of the doubt here. Regardless of where the hardware goes, using software from the likes of MS is going to be an anchor around the next of the project. Given all the past evidence of Microsoft dealings, the burden of proof is on *you* to show why wait-and-see isn't just going to yield the same dire results this time. "From everything I read before getting my XO-1, I was sure that it was going to run on 1 Watt of power (at least at times). But then I learned that that wasn't going to happen until the dawning of Update-1, which was going to be in early January ... then February ... then April ... For months I was checking for it on websites every morning before doing anything else. Now that the OLPC team is going to be churning out two new laptops and making things work with Windows, Update-1 is never going to happen is it? (no 1W of power, no source key, no extended mouse pad, etc.) I don't really want to go through the drama of doing this all again. I wish they wouldn't temp me with that 1W dream." Ebook mode is under 1W in recent builds. Update.1 Release Candidate (build 703) is available. Please test, and file bug reports at http://dev.laptop.org/. I have 703 on my G1G1 XO but I don't see even similar numbers to those you included. Could you tell me how you activate Sleep on your XO and get 0.25W? Does your XO actually work according the data you pasted or you just copied OLPC "wishlist" consumption data from the OLPC wiki? This feels a kind of 2005 for me. Negroponte releases a concept product that will not be available anytime soon, everybody gets excited but no one thinks it's feasible. But this time around, the skeptics have more arguments for "they will never deliver it"
I think that the xo-2 has a lot of good ideas that are certainly worth exploring. In the distance learning program that I ran when you asked younger children to select the right answer they usually put their finger on the screen as it is more natural for them without any training on basic computer skils (keyboard, mouse, etc. )so a touchscreen would be a better solution. The fact that the keyboard, screen, and the "look and feel" can be adjusted for the age of the user is very smart... older children even in remote areas are not looking for a "toy" but the "toy look" is very appropriate for younger children. I am still skeptical until we here the rest of the specs and I am sure that this will improve on issues that they have run into with the early pioneering programs and I am sure that it will still be revolutionary but to what end. If we still do not have an implementation plan in place then this is all just an academic exercise. But with regards to the xo-2 I am still a little excited. would be a sweet device. If the user interface is clunky one can just put Maemo or Ubuntu Mobile on it. Now we know what Bill Gates is getting for his "foundation" money in the third world... a bogus demand from their governments that students need to learn Windows. There is NO reason for any child to know Windows AT ALL. Content for children is on the Internet, which can be accessed just as easily from Linux as Windows. What does it mean to "learn" Windows? Does it mean discovering where one's files are? How to start a program? There is no learning involved. It's just a succession of simple keystrokes that can change from version to version. If they are worried about that, they should ask Linux (which is free and modifiable by the user) to imitate Windows. Don't get me wrong; the concept looks like a great device -- for a low wear-and-tear environment -- but not as a device meant to survive the daily rigors of the global South. They should send the design over to Ms. Jepsen at Pixel Qi and let her commercialize it and keep working on the XO-1 at 1CC. Right you are! Shame on the OLPC foundation for caving in. But politics has more say than technology, any day. Great news that the G1G1 programme will be opened up to Europe! Can I give a quick plug for my new OLPC London community group: http://groups.google.com/group/olpc-london - once there are enough xo owners in London I'm going to organise some meetups & workshops! Please: Where did you get the photos? Are there more? Is there a demo video? I want to know if these are just CG mockups or if a real prototype exists. Douglas, the photos I reposted here were released by OLPC yesterday as part of their press-release. Combined with the video of Negroponte speaking (see the laptopmag link I posted before) this is the only visual matterial that I'm aware of being online at this time. I might go for the summer G1G1 program. I missed the last one by about a week (that is what I get for stopping reading the blog for a few months). Now that I know about this one in advance I can start saving up, I want to get 2! It all depends on if I am spending my money to get machines that will be useful for my younger siblings, or if I am only doing it to be able to play with the new (however buggy) technology. i wonder if the touchscreen could be used with stylus for writing? that would possibly make more natural means of input than even a keyboard. if not -- isn't it a step back even from small stylus areas in XO-1? @ brano tichy: No I do not believe that the touchscreen could be used with a stylus. As for being a step back from the stylus areas on the XO-1, does the stylus area work on your XO-1? It doesn't on mine so the lack of one on the XO-2 isn't a step back... it's the same. CGI rendering of the XOXO looks like a cross between the MacBook Air and the iPhone. It seems Irvin left us some clones to continue the work. First, if anyone can pull the XO-2 of, it will be Mary-Lou. She did it with the XO1 (which everyone dismissed as impossible). She did it before. I can see her do it again. Furthermore, the lower price and lower power requirements make up for every objection I have seen. The visual impaired will not get an XO* anyway. We can be very assured that Intel is working like mad to get a low powered x86 chip out of the door. They will do it, one way or another. MS can rebrand anything as Vista Light/Economy. Be it XP embeded, CE, or a *BSD kernel with a wine clone. They have done it before, they will do it again. MS biggest problem at the moment is the massive brain drain they are experiencing. They are hemmoraging good developers. They might not be able to rebuild XP to run on the XO-2 in house. Maybe NN did not only pulled the leg of the FOSS people, but also one of MS. The tablet mode works just fine on the Btest-1 XO that I am typing this on. It has been disabled in software versions newer than what I use, but I would expect this feature to be included in future releases. Some people are having mechanical problems with the current keyboards but what it really giving OLPC so much trouble is having to deal with so many different layouts. This isn't good for mass production. Current capacitive touch screens can't be used with a stylus but that doesn't mean that it isn't possible to develop one that can (for no extra cost beyond the stylus itself). As long as the screen is multitouch and the stylus is conductive it should be mostly a matter of software. Of course, children never take very long to lose stuff like that. Google Android would run well on this! Ad it has support for touch right now! Plus it's free. Android would let them switch easily to a highly integrated / ultra low power ARM processor. "The XO-2, or XOXO as it's also called"
Christoph, does OLPC actually call it as XOXO? My friend at the event reported that he heard no words of XOXO. Susan, in terms of the interface you're going to need much more than anything Google Android (or any other solution for that matter) offers these days to make such a device usable. Realistically "Sugar-XOXO" is a completely different kind of beast and we would have to start working on it, from scratch, *today*. even better than an UMPC! Small and beautiful! I would get three of those XOXO systems for my kids and would pay for atleast 6 systems to sponsor some one else who would need one! Why not also make a "Delux" / sponsor version with a nice exterior that could be sold for some more bucks, to sponsor some others othe there. I guess if it was designed beautiful it could be used by a much bigger community to get some more money for it around the world. I really like the ide of two screens, both dual/multi touch sensible with possibilities to display different input interfaces depending of application and user, it's a killer thing. What i would like to see is the availability to communicate between people around the world, and locally without an access point between those devices. Why not also add a small/cheap web camera to the frame! Regarding Operating system, make it a totally OpenSource solution! Use the linux community for development and support for it! I don't care about XP or other operating systems. I've always been a big fan of the Star Trek PADD devices. With a 7 inch touch screen that sort of tablet sized device would run Sugar very sweetly. Maybe something like this but with a bigger screen? I did a little figuring and by my calculations the XO-2 will be about the size of a regular piece of paper shrunk by 70%. At first I thought this would make for a good pdf ereader, where a full page could be viewed without scrolling if the XO-2 is held in a portrait orientation; however, after using The GIMP to make an A4 sized document at the XO's dpi (for color, not the higher grayscale dpi) and then scaling that document by 70% the text was readable but small. And I imagine reading at that scale would soon become tiresome. The gap between the screens would also disrupt the flow of reading. Perhaps I'm wrong and it would look great. Would someone with more knowledgeable about scaling, dpi, readability, and such care to check this out? Why in the world can't someone come out with an ereader that can display a full-sized page? I care close to zero about being able to read paperbacks on an ereader. Textbooks, technical documents, etc. are all almost exclusively formatted as 8.5x11 or A4. If the XO-2 could be used to read these documents easily (without reformatting, or scrolling) it would be useful not only to young students but to older students and anyone who ever needs to read a pdf. They would sell like hotcakes! I think we should petition the OLPC project to give this serious consideration. Who's with me? 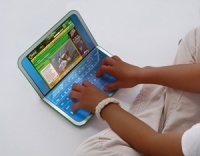 I just think the lack of tactile keyboard response will make childrens' fingers very sore. Can we get some input from an ergonomist? My name is Katya, i'm a picture editor at Esquire magazine russian edition. We are really impressed and inspired by OLPC (One Laptop per Child) - XO-2 and would like to write about OLPC at our "Esquire 10" feature July-Aug issue. Unfortunately our deadline is 10th of June. Ah, vaporware. It smells so good, until you try to actually taste it. Vaporware? You mean like Sugar? It was going to be this new, great, compact, editable (access to the source) environment. Now that it's out it's ridiculously unstable, bloated, and the code is such a disaster no one would have a hope of tooling around in it. Not to mention upgrades mean app breakage. Not to mention new versions don't even run on the target hardware properly. I'm still waiting for Duke Nukem Forever.